A laptop is observing itself in the mirror with a webcam. It is “sat” on a chair in a white empty space, connected to a device (Arduino) for translating computer code into mechanical operation. Arduino feeds the code into two rotary engines, which are fixed to the upper left and right corners of an easel. 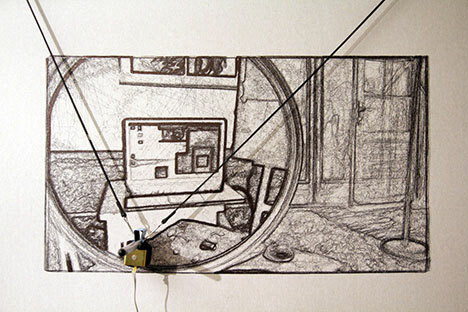 A globular plastic rope is affixed to the engines’ bearings; ball by ball, it guides the movement of the drawing pen over the painting surface. Boštjan Čadež upgraded and customised the complex code for computer vision with which computer entities learn to detect physical space. The laptop draws its vision of itself and simultaneously calculates, adjusts and transmits its vision – but not in a linear fashion, say from left to right or from top to bottom – rather, it transpires point by point, in line with the momentary “decision” of the computer, or rather, in accordance with its calculations. 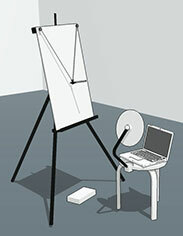 During the exhibition, the laptop is going to produce one portrait, or croquis, per day. These portraits are going to be exhibited in the space and thus become a new (self-referential) element in the laptop’s field of vision. Throughout the history of fine arts, painters have put themselves in the spotlight when certain life-changing events have occurred. Generally, they have painted self-portraits as a departure from their usual mode of painting, using them as swift gestures or psychological reflections presenting specific characteristic expressions of their style (Van Gogh, Rembrandt, Kobilica). With the repetition of one and the same motif, the deepest connection between the painter’s subjectivity and the artistic medium came to light. Expressions of self-consciousness and self-representation proliferated from the second half of the 20th century onwards; artists no longer sought merely to express their style or to represent themselves in a psychologically realistic manner; rather, they started to distinctly manipulate various modes of representation. First, they invested their entire body into gestures, they engaged with political and social identities and, later on, started to question them; they started exploring programmed or coded artistic acts (for instance, Tehching Hsieh: One-Year Performance). The recording of self-portraits was not merely an expression of artistic narcissism; rather, it became a manifestation of preoccupation with one’s own identity, which is implicit in every individual. In the last century, we witnessed changes in conceptualisations of artistic identity and work, in which the artist was no longer the “creator” of an autonomous art object; rather, he or she proceeded from various production methods, which no longer reflected his or her style in a given medium; instead, the artist used the medium as a tool with which he or she coded and hacked into the world that surrounded them. In conceptualising this work, Čadež appropriates the cliché motif of an artist painting a self-portrait, acquiring its first contours as a painterly motif in a convex rear-view mirror featured in Jan van Eyck’s 1434 painting the Portrait of Giovanni Arnolfini and his Wife. Later, this motif may be observed in numerous playful baroque and rococo renditions, whereas Egon Schiele and Frida Kahlo gave it psychological gravity in their heavy self-portraits. With respect to art-historical memory evoked by this account, a reflection on the changed relation to the self emerges; particularly to representations of the self brought about by digital technology and the use of computers in everyday life. The impact is not limited to the instantaneous access to digital photography, which has enabled everyone to perform endless repetitions and manipulations of self-representation (for instance, in social networks); rather, it also encompasses our cognitive processes on a semantic level, where the logic of computer language has a direct influence on our thinking, reasoning, gesticulation, etc. 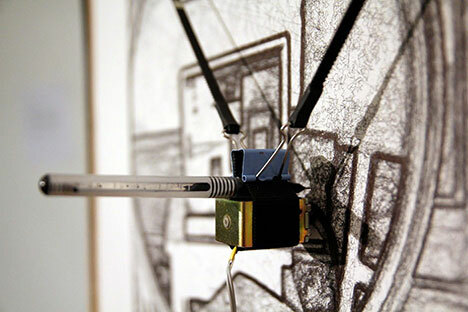 In Self-Portrait, Čadež inverts this logic and explores, through experimentation, to what extent computers are capable of being creative or free. Is there an element in computer vision that can be inventive without human intervention or without referring to human existence? The computer’s creative moment can be understood, above all, as a glitch, that is, an error – a glitch, however, that cannot be so grave as to cause the self-destruction of the system. Possible deviations will emerge through a comparison of all self-portraits that are going to be drawn during the exhibition. While Čadež is indeed the author of the code that guides the computer’s vision of itself, he allows the possibility of attributing authorship to the computer when it comes to errors. We can easily attribute originality to that which departs from the already seen, that which is new and unpredictable. If unpredictability is inscribed in the source code as such, then the computer is no longer merely the executor of the matrix; rather, it “creates of its own accord” and it records deviations from the prescribed behaviour and, in so doing, it creates its own strokes, such as those we admire in fine art painting. Self-Portrait triggers the idea about artificial intelligence even though the nature of the system as such is not intelligent or self-reflexive. The attempt to transfer and convert the seen from the digital via the mechanical into “representation of reality” can be seen as an attempt at an intelligent work of art, determined by the impulsiveness, or rather, the unpredictability of the code. The computer’s self-portrait is not a photographic self-portrait in which the webcam’s eye would produce a digital image; rather, it is a process that evolves with time and takes into account computer vision as the feature of the computer that makes it alive, for it depends on the duration of its existence. The acceptance of such a view is radically not homo-centric and it allows for different views of the self and new possibilities of representing the seen. Boštjan Čadež (b. 1979 in Ljubljana) is an intermedia artist. He studied industrial design at the Academy of Fine Arts and Design in Ljubljana. During his studies, he received an award for outstanding accomplishment for the design of the Sporty tyre, which is still produced by the company Sava. At the same time, he was active as a graffiti and street artist, and he published three compilations of audio reactive animations on the website of Winamp, a very popular mp3 player at the time. With the interactive computer toy Line Rider, designed under the supervision of Professor Zdravko Papič, he had success in the global market and for this work he received a prestigious award for innovation at the computer game developers conference in San Francisco. Afterwards, in collaboration with artist Velibor Barišič, he took part in the PPP Box project in which major galleries at home and abroad exhibited the works of several dozens of artists. 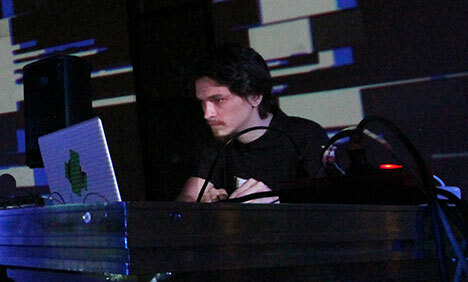 Since 2009, he has been focusing on the field of real-time generated and generative computer graphics.